>Saint John Orthodox Church (my parish here in Memphis) is holding its annual Vacation Church School this week. The young women (for the most part) responsible for the amazingly creative themes and activities at this event each summer keep trumping themselves year after year. One year they chose saints who had special relationships with animals to be the names of each “team” … like Saint Seraphim’s Bears and Saint Ignatius’ Lions and Saint Simeon’s Snakes. They followed this theme of nature and our connection with the earth throughout the week. Then one year it was all about the Holy Mysteries… and they followed “clues” all week to discover the mystical aspects of worship and spirituality. This year, the theme is “Windows to Heaven”… which is all about icons. Today was Day 2 of 5, and the only day I was asked to participate in, so my photos are just from today. Kudos for the planning and all five days of energetic leadership go to organizers Caitlyn Manning (center) and Gigi Snowden (2nd from right), and helpers Kim Hilal (far right) Clark McGee (far left), and others who just showed up to help serve snacks, clean up, take pictures (thanks, Claire, great with child!) and pray with us. Then he invited everyone to kiss the newly blessed icon before dismissing us back downstairs for the morning’s activities. 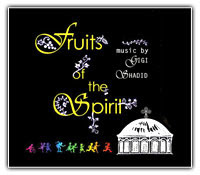 Caitlyn led the children in songs, many of which came from Gigi Shadid’s CD, Fruits of the Spirit including the song, “Icons are Windows to Heaven.” All through the week, whenever anyone said, “windows,” the children would respond, “to Heaven!” and throw their arms up in the air, index fingers pointing to Heaven. The teams were organized this year around COLORS… with each team learning about the meaning attributed to the colors used in icons, like RED for martyrdom and GREEN for new life and PURPLE for royalty, etc. I wasn’t there on Monday, but I heard that Kim Hilal gave a great lesson on the iconoclasts which will help the kids understand even more what a great victory it is that we celebrate every year on Orthodoxy Sunday. So, today, it was my task, as an iconographer, to demonstrate some of what is involved in writing (or painting) icons. In an hour and a half. To a room full of five to eleven-year-olds. …so that the gold leaf will stick to it. This process, called oil gilding, is just one way of applying gold leaf to icons. The breathing warms up the clay and activates the glue. They all did a great job breathing and applying the gold leaf. Pavel (above) got the technique down really quickly… and Lydia (right) did a great job applying the gold leaf after the breathing was done. Next I demonstrated how egg yolk emulsion is made… separating the egg yolk from the white, and then removing the membrane by rolling the yolk on a paper towel, then poking a hole in the yolk and letting the insides run into the container. Holy Water is added to this emulsion, and this is what is used to mix with the dry pigments, making egg tempera. Finally, using very watery egg tempera, the children painted the base colors—green, red, yellow and brown—used on the icon of the “Angel of the Lord,” or a prototype (sketch) of the icon on paper. In doing an actual icon, it would be done on wood covered with linen and layers of gesso, with lots of sanding to prepare the board. But for today, the children were happy to paint their paper icons… and to learn more about windows…. to Heaven! Saint John’s Vacation Church School 2008 continues on Wednesday through Friday this week, where the kids will learn more about this important element of Orthodoxy, and will have the opportunity to mount icon prints on wood, and enjoy a special time of prayer, music and fellowship.